Another little painting on canvas board. I'm really enjoying doing them, and learning alot about color, and also about painting small (my personal nemesis). 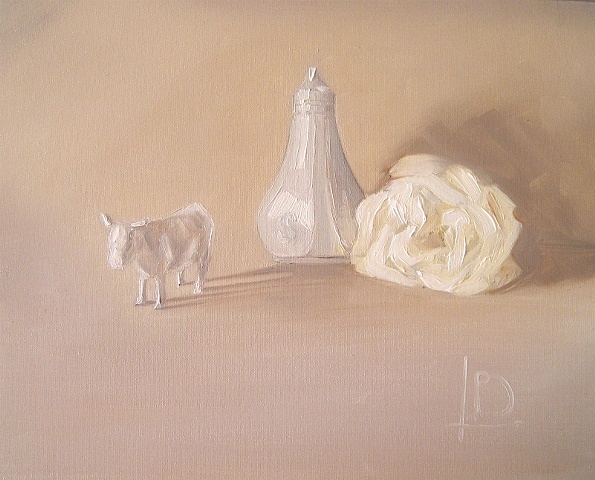 As with "Tablets of Love", I wanted to paint white objects- to play with the colors in the shadows. So, I popped along to Ceramic Mike's studio (in arch 229) to borrow a ceramic cow, and a salt shaker... have to say I was tempted to keep the cow! Anyways, I enjoyed painting them, and feel proud that for the first time in I don't know how long, I didn't pick up a tube of red or pink oil paint.